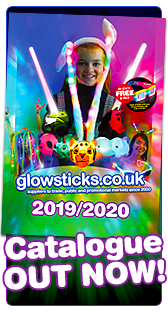 Glowsticks .co.uk are dedicated in offering a wide range of top quality & safe glow and battery operated light products to retail, wholesale, fundraising & promotional markets. We have been glow sticks suppliers since January 2000 and have gained much experience in both product development and distribution. We are a limited company & have offices, large distribution warehouse and staff to facilitate swift delivery of a large range of products. Although we do sell 'novelty products' our focus is on quality & safety rather than maximising profits with poor quality products. All products are UK certified and comply with the latest RoHS regulations. 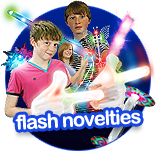 We offer a widening range of glow products to members of the public, PTA's, Schools & Universities, wholesale glow novelties to the events, fundraising & party markets and promotional glow products to corporate companies. Our customers include Warner Brothers 'Charlie & the Chocolate Factory', BBC, ITV, Hatrick Productions, Endemol (Big Brother etc) Universities, Schools & PTA's, clubs & independant DJ's to name a few. 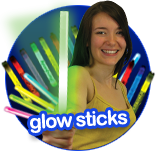 Glowsticks .co.uk strive to ensure that you are happy with our glow products and also your on-line shopping experience. If you have any suggestions, comments, questions or requests please contact Glowsticks using the 'contact us' email form - we will be glad to hear from you! Glowsticks .co.uk is owned & operated by The Glow company UK Ltd.
All content & images are copyrighted by The Glow Company UK Ltd. - we will prosecute for any infringements. We also sponsor The Apex Challenge and a variety of other national events and organisations.